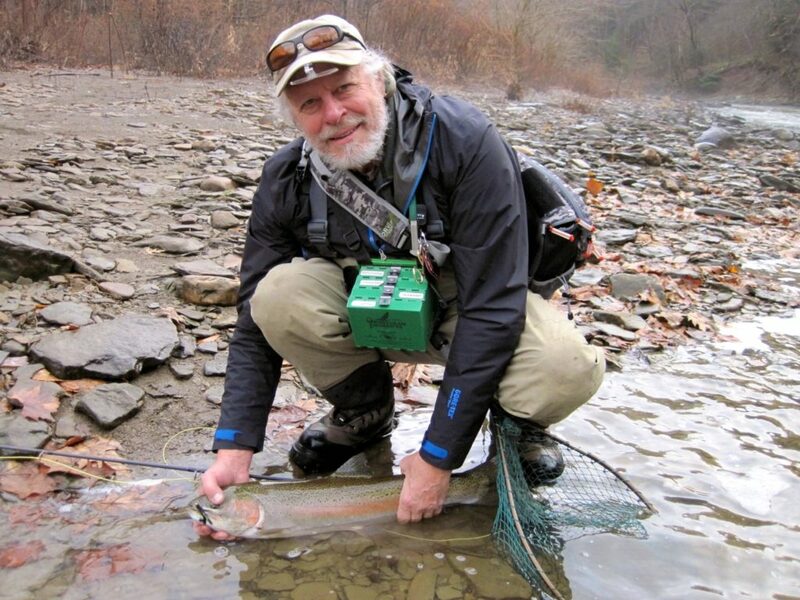 Reports from Mike Durkalec for steelhead and other gamefish in Rocky and Chagrin Rivers. Steelhead Alley refers to the many river tributaries that flow into Lake Erie from its southern shore bordering Ohio, Pennsylvania and New York. Each spring, all three states stock hundreds of thousands of one-year old steelhead trout into the tributaries. These trout, called smolt, averaging approximately 8-inches in length, immediately migrate into Lake Erie after stocking where they feed on a variety of abundant food sources. The steelhead trout is a migratory variant of the rainbow trout that originates from the Pacific Coast states. After egg hatch in Pacific coast streams, the young trout may spend a year or two in the stream where they develop into the migratory smolt stage. The smolt migrates to the Pacific Ocean where they grow rapidly. They return to their native streams, many pounds heavier, to spawn. Those that survive the spawning run, return to the ocean to grow even larger, and can spawn again year after year. Some of these old survivors may grow to exceeds 20 pounds and 3 feet in length. The strains of steelhead trout stocked in Steelhead Alley streams originated in California, but first adapted to and reproduced in Lake Michigan and its tributaries for over a century. In the mid 1990’s, Ohio began stocking a strain from the Little Manistee River in Michigan. These fish migrate into the fresh water of Lake Erie, and similar to those that migrate into the salt water of the Pacific Ocean, they grow rapidly. The Ohio Division of Wildlife raises approximately 150,000-steelhead smolt in its newly renovated and enlarged fish hatchery at Castalia. The smolt are stocked each year in the Vermillion, Rocky, Grand, Chagrin, Conneaut and Ashtabula Rivers. After 2 years in the Lake when they return to spawn, they have grown to an average 23-inches long and 4-5 pounds. After 3 years they are 26-inches and 6-7 pounds and 4 years are 28 inches and 8-10 pounds. The prime months to fish for steelhead are late October, November and December in the fall and March and April in the spring. The eastern Ohio tributaries fish well in both fall and spring, whereas the central Ohio tributaries fish best in the spring. A map of Lake Erie and all streams stocked by Ohio, Pennsylvania and New York is provided here. 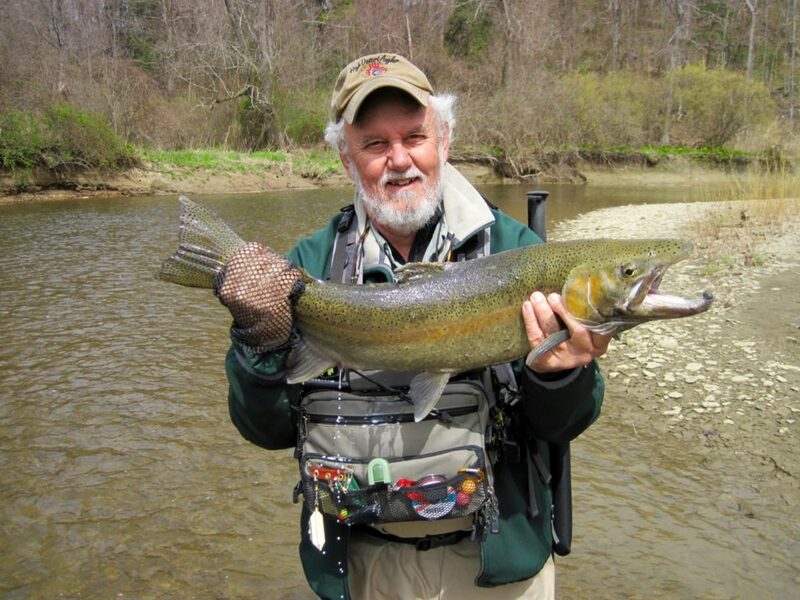 For detailed fishing maps of Ohio tributaries, check online with the Ohio Division of Wildlife. 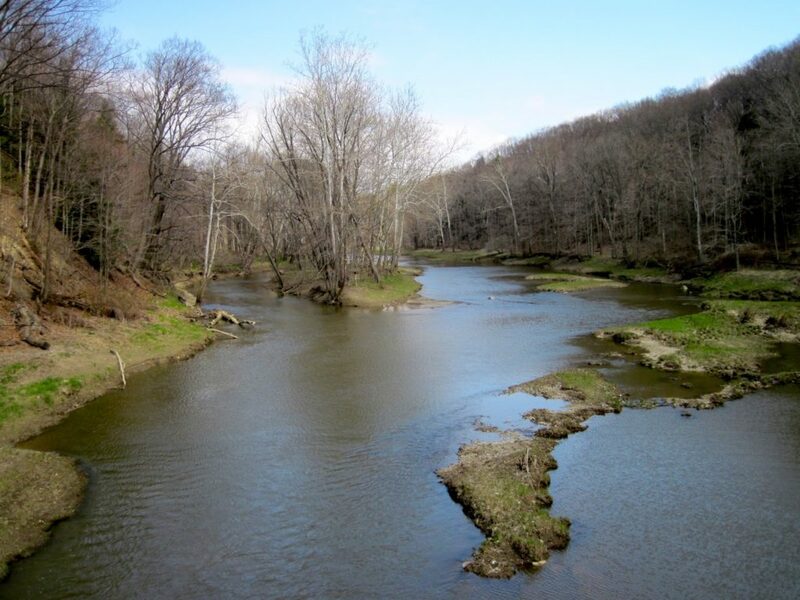 For water levels on Ohio tributaries, except the Ashtabula River, find them on the USGS National water information system website. For greater detail on how and when to fish for Steelhead Alley steelhead, read the articles on this website by Kevin Kayle, Jeff Liskay and Jerry Darkes. Rivers are listed, top to bottom, from smallest to largest watershed size. 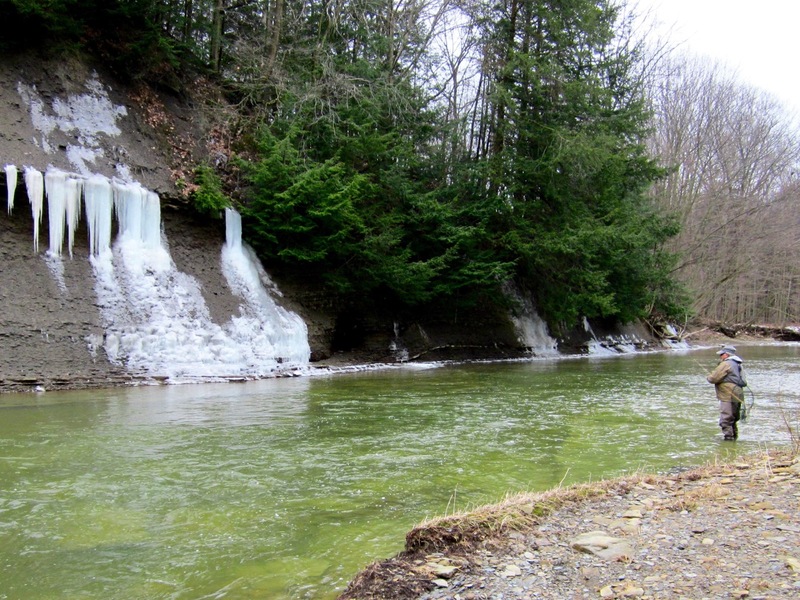 Smaller rivers tend to clear and become fishable before larger rivers after heavy rainfall or snow melt. There is no water gauge on the Ashtabula River, but it generally clears before other Ohio tributaries. Thanks to Randy Rowe for collecting data on best flow rates. Fishing the Ashtabula River on a beautiful winter day. 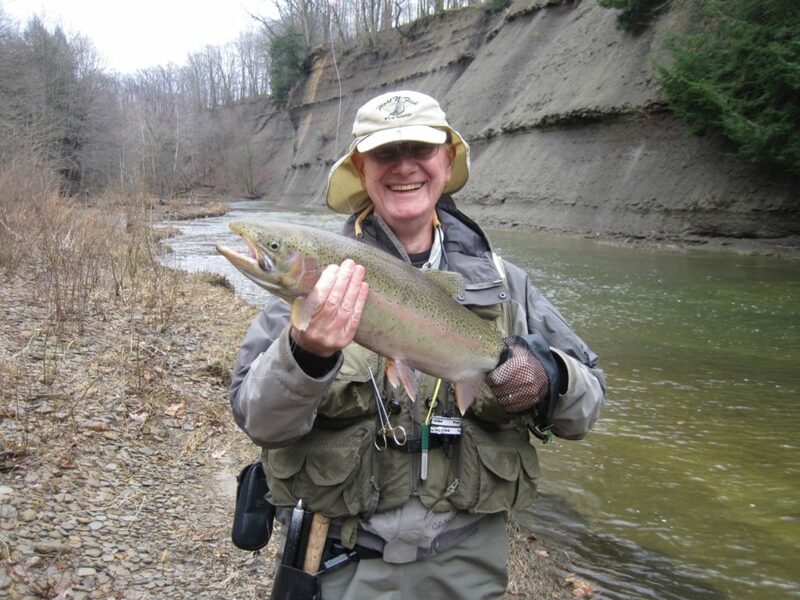 A happy Harry Hoitink with a pretty Ashtabula Steelhead. Randy Rowe with a 13-pound steelhead that took him 100 yards downstream before coming to the landing net. Floyd Scahanbacher with a nice buck. 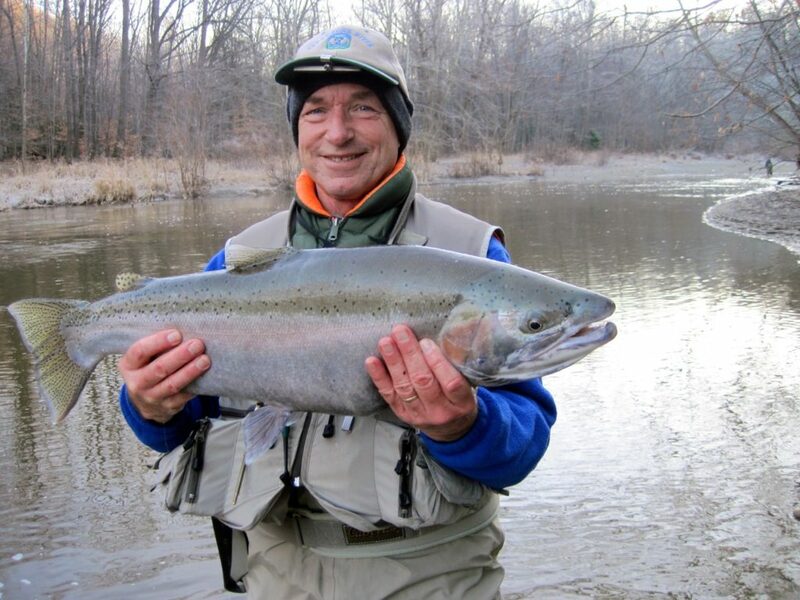 Ohio TU Council Chair, Don Dean, with an Ashtabula Steelhead. 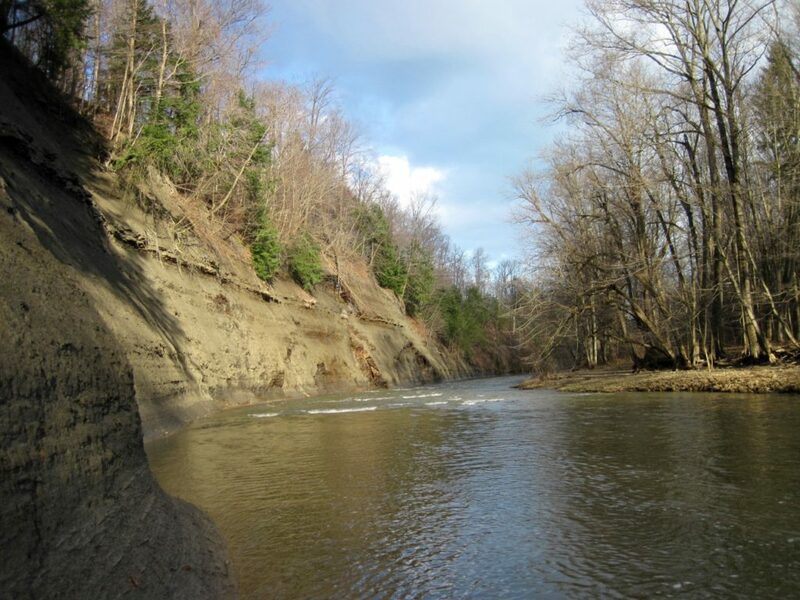 Grand River is often too high to fish after heavy rain storms, but is a great steelhead fishery when water levels drop. 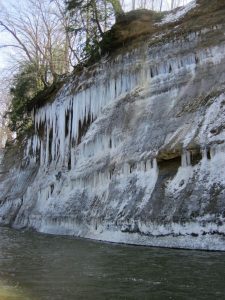 Steelhead Alley tributaries are characterized by high shale cliffs and spectacular beauty both in winter and fall.